Let’s talk about the regal pumpkin’s DNA. The big question is: is it a fruit or a vegetable? It’s both! Botanically a fruit, but culinary wise, a vegetable. How magical is that? With their round shape, and smooth, slightly ribbed skin, how can you not fall in love with their deep yellows and oranges? Each individual pumpkin is so beautiful, and can be found in pumpkin patches that resemble a bewitching sea of orange, gold, and cream colors. They are perfectly different, yet all from the same family. As we enter the final week of November, let’s give up some autumn love by baking up a Pumpkin Praline Maple Cream Cheese Cake (aka the Queen of Pumpkin Cakes). I pumpkins! 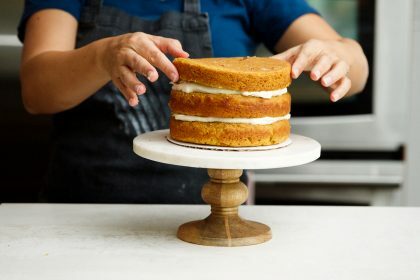 Food 52 shared this awesome pumpkin cake with its secret ingredient of evaporated milk (evaporated milk is also made by heating milk until about 60 percent of it’s water content has evaporated resulting in a dense creamy milk.) YUM! 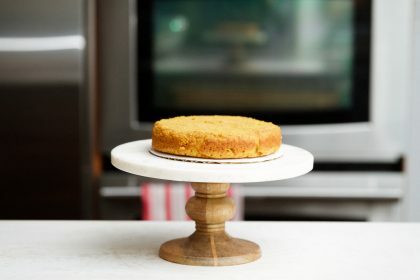 The cake recipe author, Posie Harwood, adapted this showstopper from an old Land O’Lakes recipe. Posie’s covert operation of pumpkin and evaporated milk gives this cake a delicate crumb texture with layers of spice flavor. 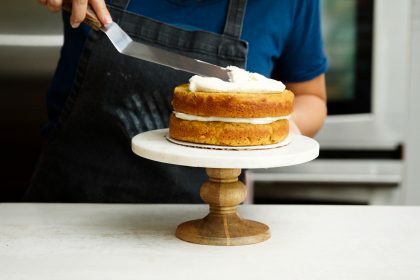 Start with a simple maple cream cheese frosting which is really just a rich american buttercream balanced with cheesy goodness, oh, and maple, of course! This gooey sticky wonderful praline pie topping is an easy one-pot sauce. Maple syrup, butter, and cream make this combo the perfect topping on this flavor-bursting cake. 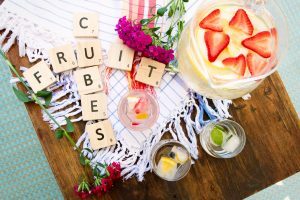 This is a perfect recipe for us busy mothers and can be executed in less than 15 minutes if you have all your pieces pre-made (cake + frosting + sauce). Next, it’s time to bake the cakes. The batter is deliciously simple and straight forward. 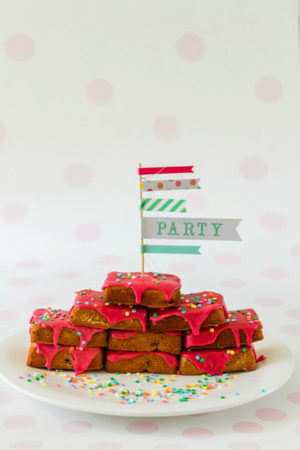 Start off with cutting each cake, then get rolling with layering this fantastic combo of flavors. 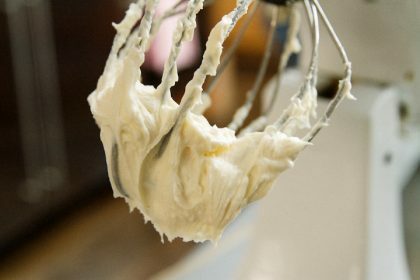 Here’s the fun part: grab an ice cream scooper to pack on the cream cheese frosting. I used 3 small scoops for each layer. Easy peasie! Be sure after each layer to adjust the frosting so that it’s properly aligned. Cakes are so easy and fun to build. 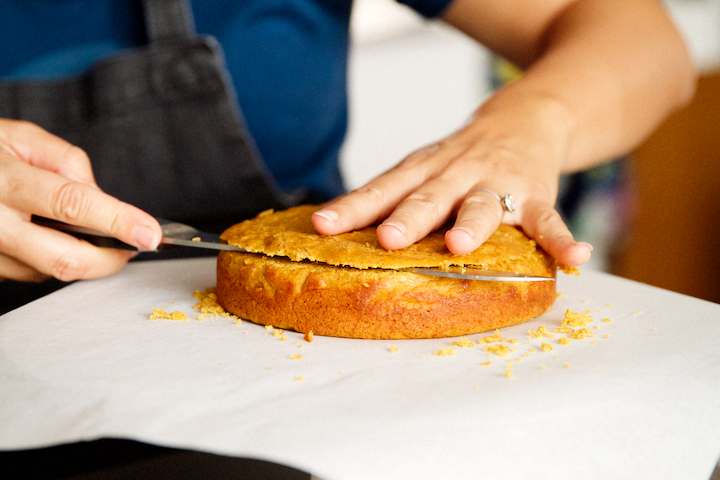 Crafting together the right flavor combos is what makes us great bakers. The frosting choice has to be stiff enough, especially with a heavier cake like this pumpkin cake. The ‘heavy’ being defined as dense because the base is made from pumpkin, a solid ingredient that is bold and gives great structure. 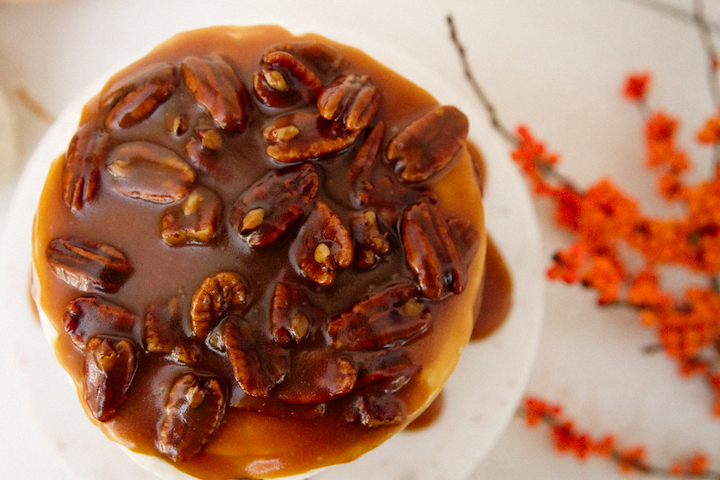 Finishing this cake with this beautiful praline topping will make YU the crowd favorite this fall. Embrace being Queen for the day, along with your new found recipe of pumpkin-praline-maple-n-cream-cheese royalty. 1Preheat the oven to 325° F. Butter and flour three round 6-inch cake pans. 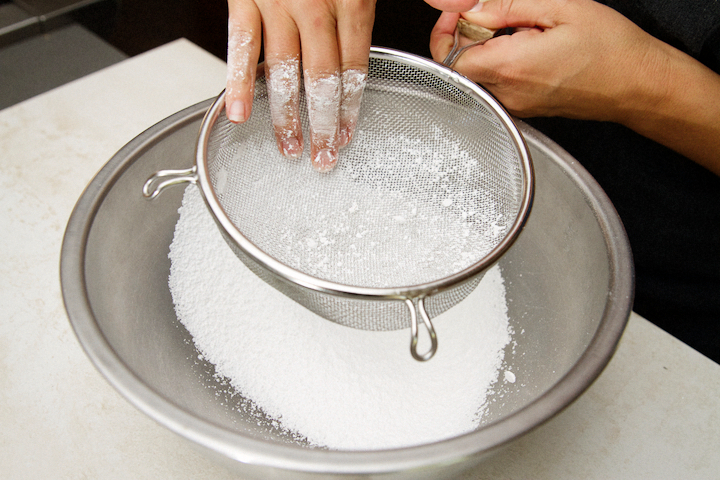 2Whisk together the flour, salt, spices, baking powder, and baking soda in a large bowl and set aside. 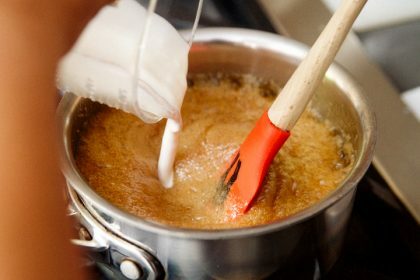 3In a separate bowl or in a stand mixer, cream together the butter and sugar until light and fluffy. Add the eggs one at a time, mixing after each addition. 4Add the pumpkin, evaporated milk, water, and vanilla, mixing after each addition. 5Add the dry ingredients and beat until just combined. 6Pour the batter into the prepared pans and bake for 35 to 40 minutes, or until the cake springs back to the touch and pulls away from the sides of the pan. Let cool in the pans for 10 minutes, then turn the cakes out onto a cooling rack to cool fully. It's best to chill the cakes in the refrigerator before frosting them. 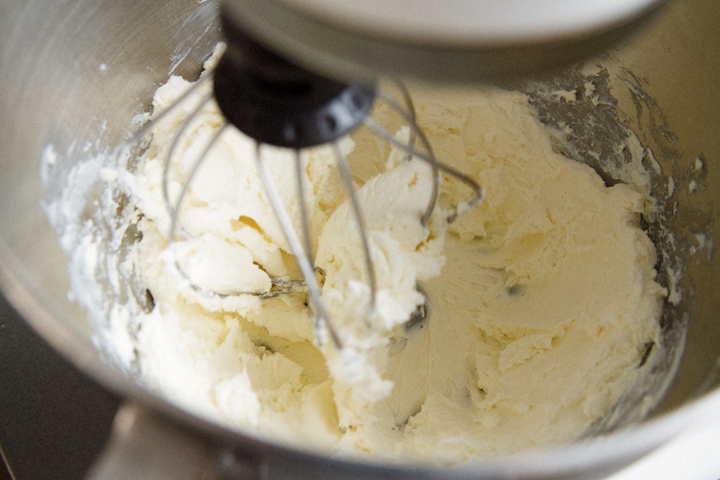 1Using an electric mixer on medium-high speed, beat cream cheese and butter in a medium bowl just to combine. 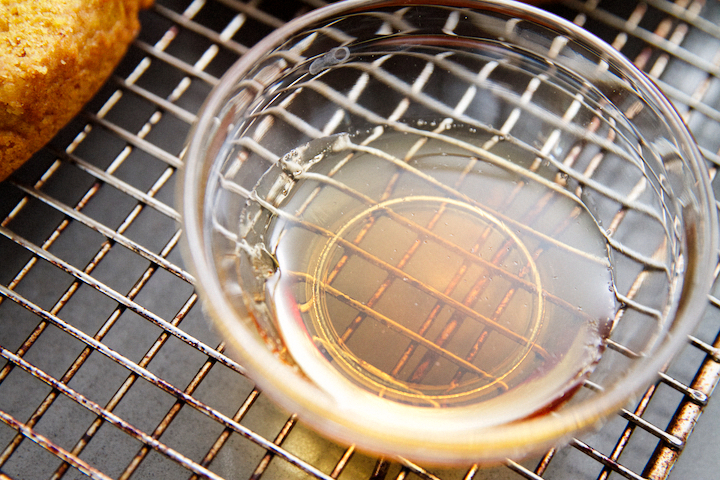 Reduce speed to low and gradually add sugar, then maple syrup and salt; beat until smooth. 1In a pot, melt the butter over medium heat. Mix in the maple syrup, sugar, vanilla, and salts and stir until homogenous. Bring the mixture to a boil and boil for 3 minutes to thicken. Pour in the heavy cream, stirring to combine. Let the mixture reduce for 3 to 4 minutes, or until it lightly coats the back of a spoon. Stir in the nuts. You will have approximately 2 1/2 cups of sauce. 2Pour over the cake by the spoonful. Let it drip over the sides. Serve immediately. Oh my goodness Cindy! 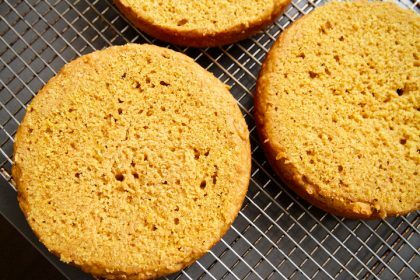 I can see why you called this The Queen of Pumpkin Cakes!! It looks totally incredible! 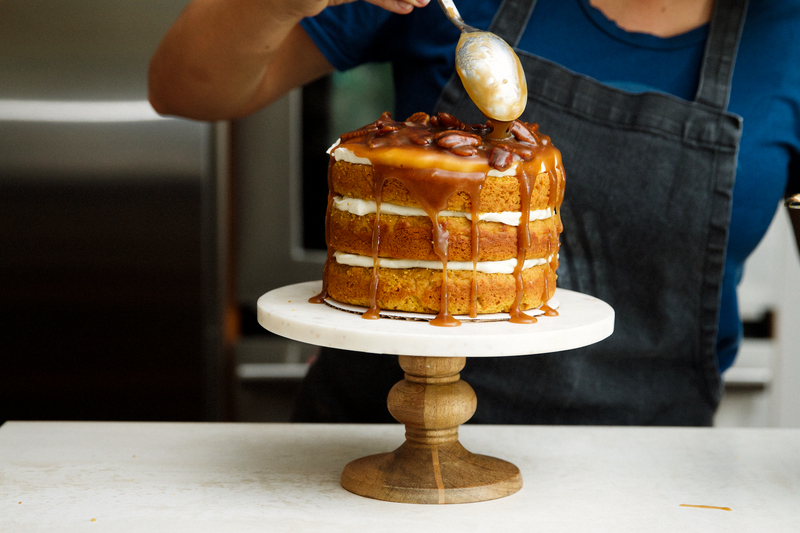 That pecan praline sauce pushes this cake totally over the top! PERFECT addition to the Thanksgiving dessert table! Thanks MaryAnn, I am so glad you enjoyed it. Can’t wait to try that jalapeno bacon cheese ball! 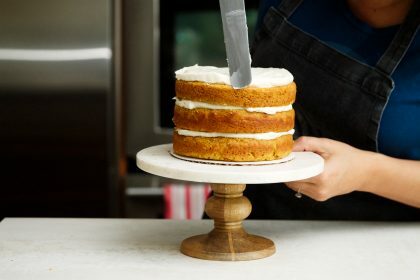 Oh my goodness, it’s only 8 o’clock in the morning and I am CRAVING a slice (or 7) of this cake, girlfriend! This is a serious show stopper! And those flavors – cream cheese, maple, AND praline – are ahhhh-mazing! I love that you used evaporated milk in here, that is such a cool trick!! This certainly looks like THE QUEEN of pumpkin cakes!! Cheers! Thanks so much Cheyanne. 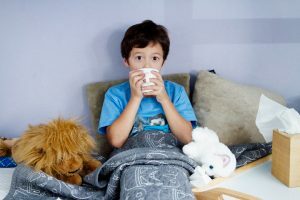 I loved your awesome post today. My husband loves soups, and I am super excited to try this for him. It is so bright and lovely. Only problem is that I don’t think I can wait until Thanksgiving. I can’t think of a better way to finish a most splendid meal! This cake is perfectly named! 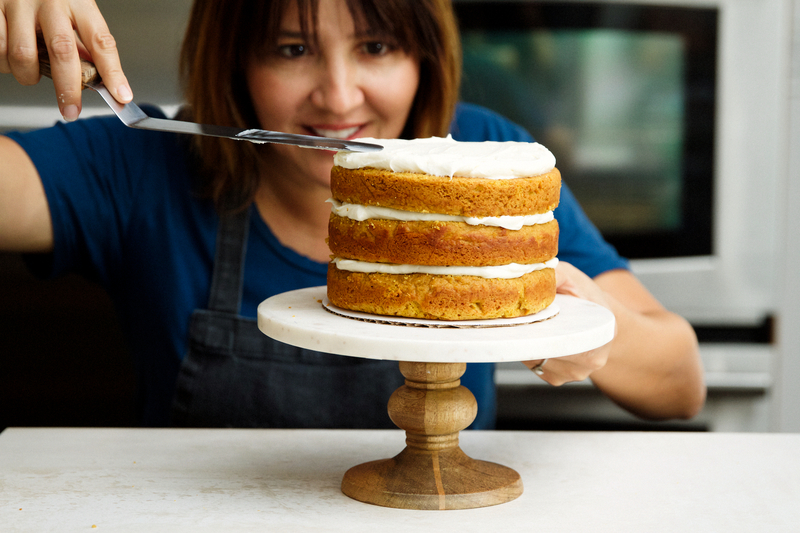 So happy to meet The Queen of Pumpkin Cakes! Delicious! Hi Annie! Thanks for your kind words, so sweet. Loved the sausage and apple stuffing. How lovely and perfect for our Thanksgiving feast this year. Looking forward to more ideas. Long live the queen! 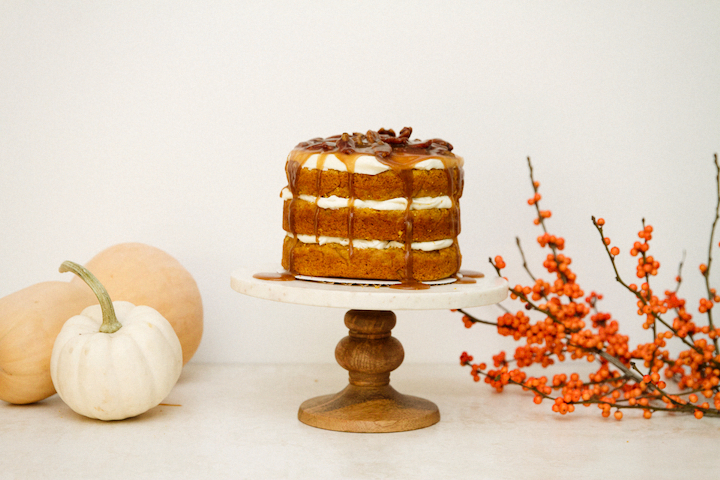 This gorgeous cake will definitely reign supreme on Thanksgiving. 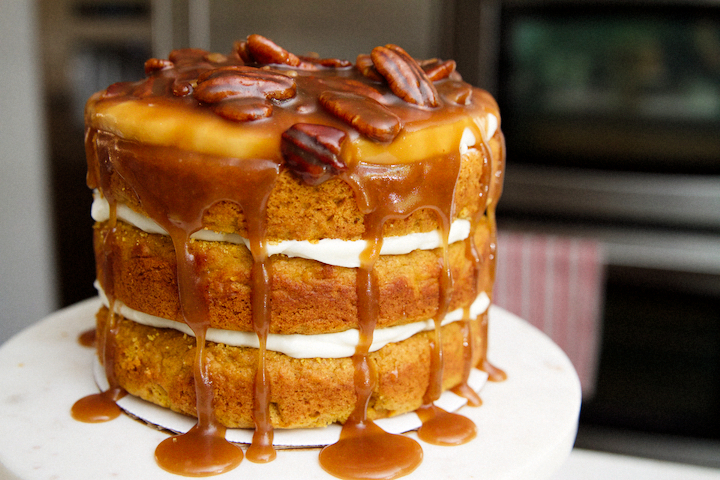 This is everything…pumpkin, praline and tangy cream cheese frosting. can we skip right to dessert?? Cathy, you are too kind! One day, I hope you can teach this rookie how to carve a proper turkey. Your turkey was truly a work of art. Congrats. Wowzah! Now this is a cake! First of all, I LOVE pumpkin cakes! Second, I could eat cream cheese frosting straight out of the bowl. 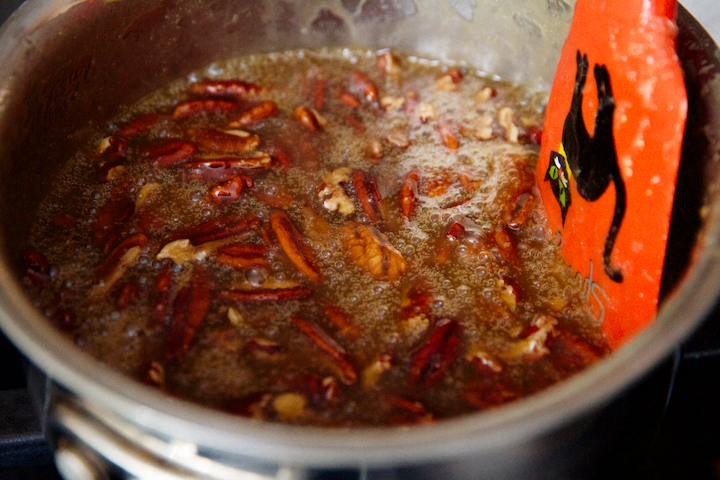 Third, praline topping…. I’m just done for! 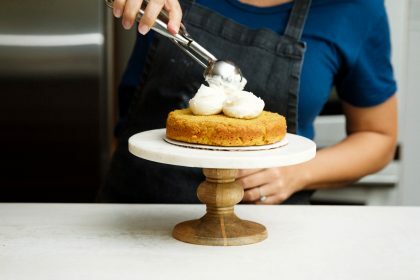 Not only is this an amazing cake, I love that it’s not your standard pumpkin or pecan pie, but still encompasses all the flavors of the season! 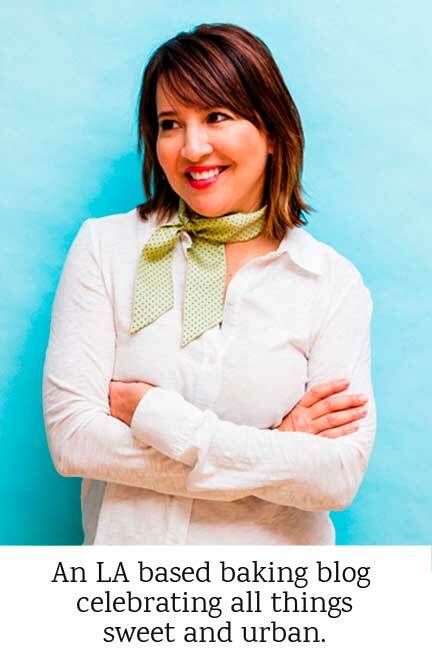 Hi Kathleen, you are too funny! I think we would get along quite well, as I could practically bathe in cream cheese and praline. Too bad that is not an option, or I could really help out this California drought situation! I loved your garlic bread today. Looking forward to trying it. Thanks! I love this. I have family coming to town for the holiday and I don’t usually do much beyond basic pumpkin pie. They will be so surprised. Thanks! April, thanks for the kind words. Please try it and let me know what you think! YUM! Wow, there is so much goodness in this cake to be thankful for this holiday season! Presenting this beauty after a Thanksgiving feast will surely bring my family to tears (the sweet kind). Thanks for sharing! Barb, I don’t want to make anyone cry, but if those tears are tears of joy, I am all in! Enjoy this baby. That looks delicious! I want a piece (or two). Thanks Joe! 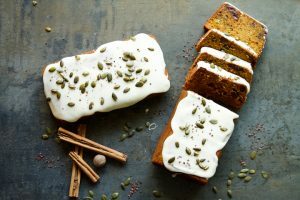 This pumpkin cake is loaded with goodness. Hope you get a slice or two or three! My mouth is watering! I. Love. Pumpkin. I will be making this decadent dessert for my family, this holiday season. 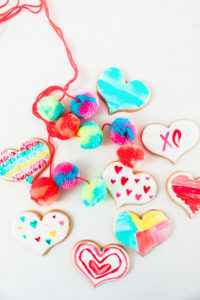 Thank you @thesweetnerd for sharing your loves….cannot wait to partake! Rose, thanks for sharing. I love pumpkin too. 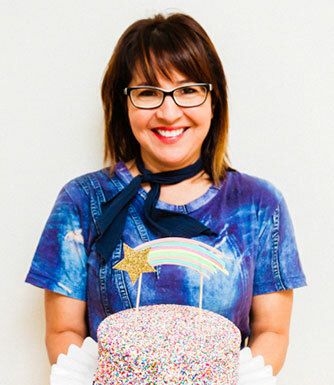 Let me know how this cake works out for your family! HA! 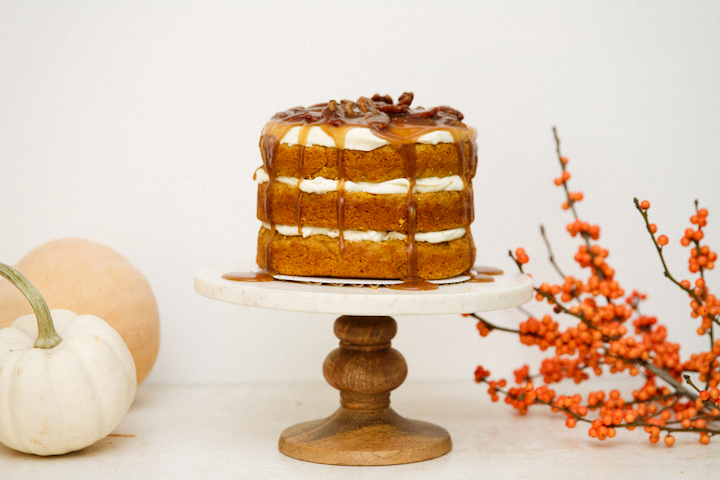 Yum, this “Queen of Pumpkin Cakes” looks decadent and a crowd pleaser! I can’t wait to try this recipe soon on my family. Also, love that I can see you making this delicious recipe in a video, I find this extremely helpful with baking! Anna, so glad you like the video! YEAH! Hope you and your family get to try it. Kids love it because of the cream cheese and maple, and adults love it for the praline and pumpkin. Enjoy!